This dish was inspired by similar ravioli I had at Angiolina in Campania. It was listed as red mullet ravioli with fennel on the menu, but it was actually served with carrot and cherry tomatoes. Here I opted to use fennel as per the original. 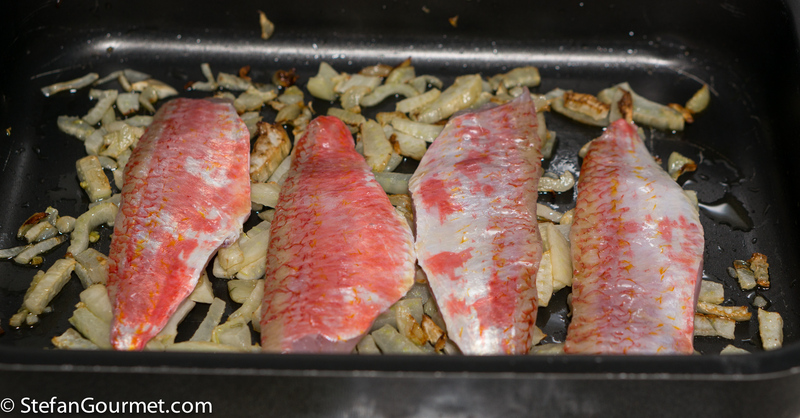 At Angiolina the red mullet was used both to fill to ravioli and for the ‘sauce’ to dress the ravioli. Fish ravioli need some kind of ‘filler’ to obtain a moist filling (just fish would make it dry). Mashed potatoes can be used for this, or bread soaked in milk or fish stock. To get more flavor, I opted for the latter. 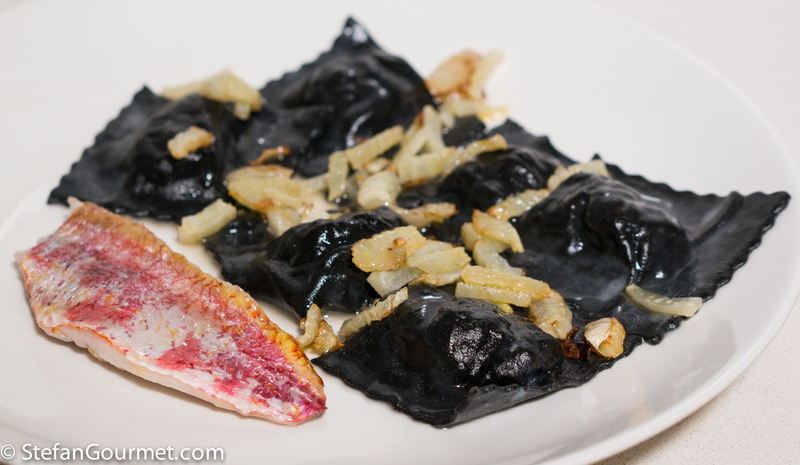 At Angiolina the pasta dough was colored with squid ink, which has a great dramatic effect. 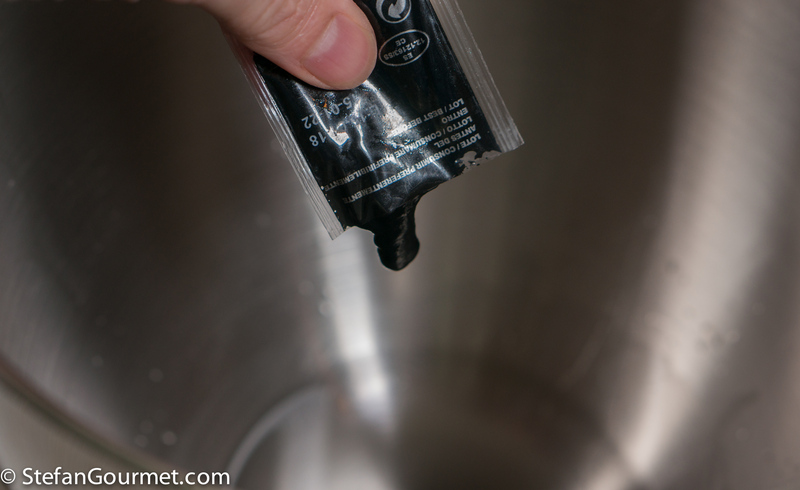 Even though the squid ink doesn’t really change the flavor, it does look great. As this was in Campania, I made the fresh pasta dough with semolina flour and water. The combination of the ravioli, fish, and fennel makes this a very nice dish. I was lucky enough to find red mullet that had been caught that morning, so it was extremely fresh and made the dish even nicer. 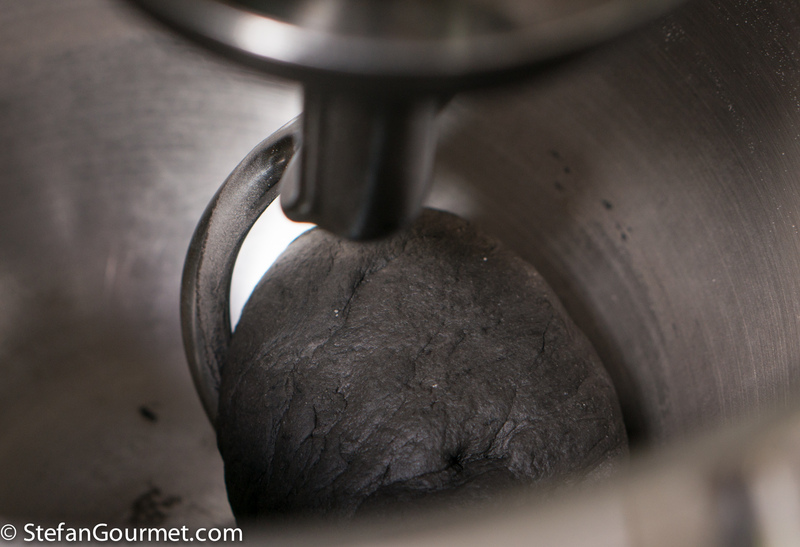 To make the pasta dough, put 80 ml of water in the bowl of a stand mixer and add the squid ink. 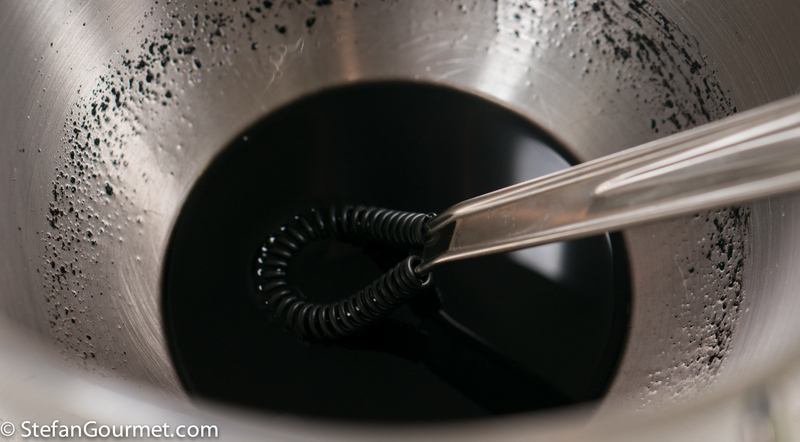 Mix it into the water with a whisk for even distribution. 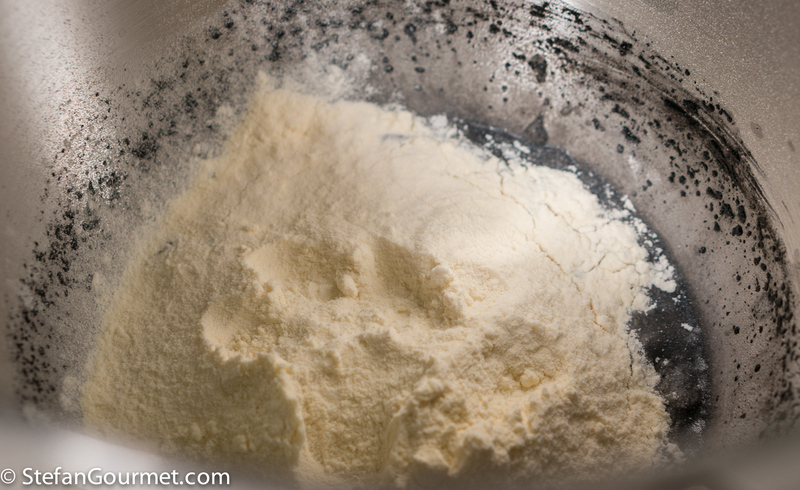 Now add the flour and 1/8 tsp of salt. 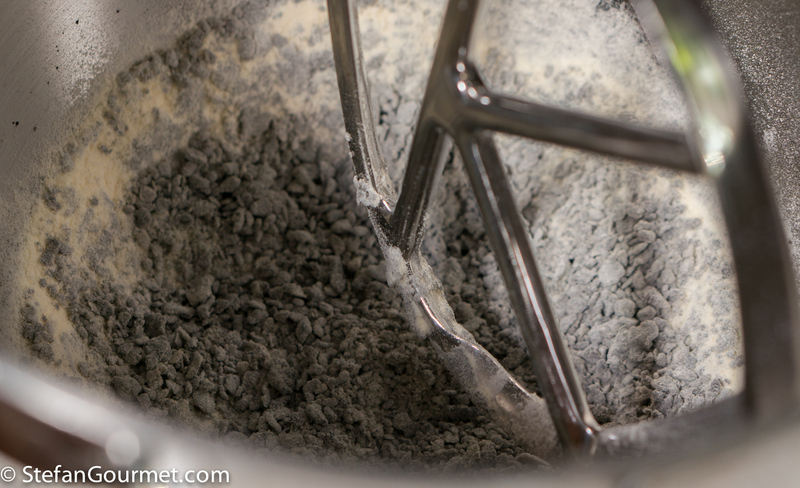 Use the paddle atachment to mix flour and water. You will probably end up with a crumbly mixture. If that happens, slowly add a bit of water until the dough just comes together. 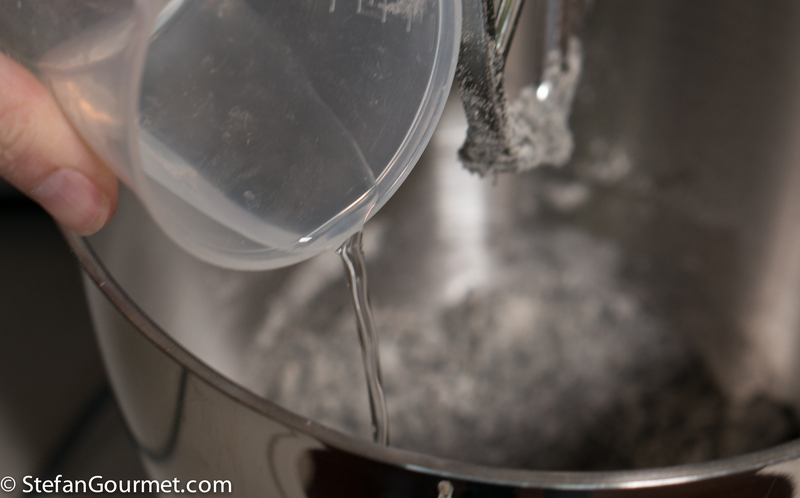 Do not add more water than needed, or it will end up too sticky. If that does happen, simply add more flour. Switch over to the dough hook and knead on medium speed until the dough is smooth and elastic, about 10 minutes. 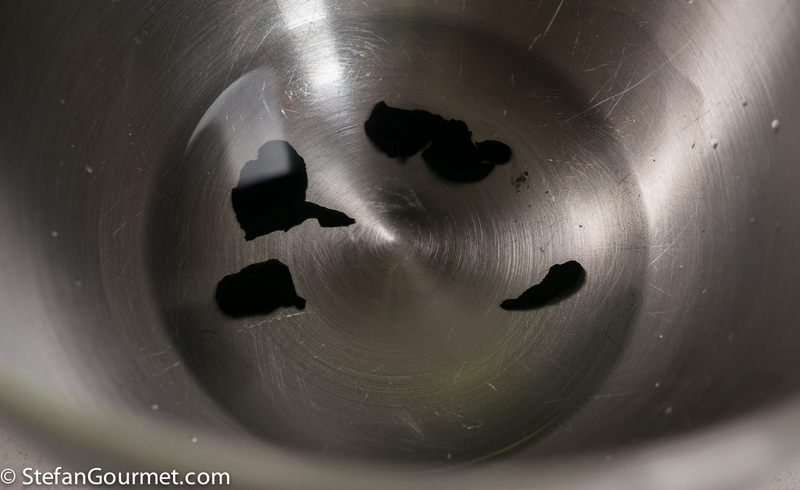 Those 4 grams of squid ink have no trouble coloring 230 grams of pasta. 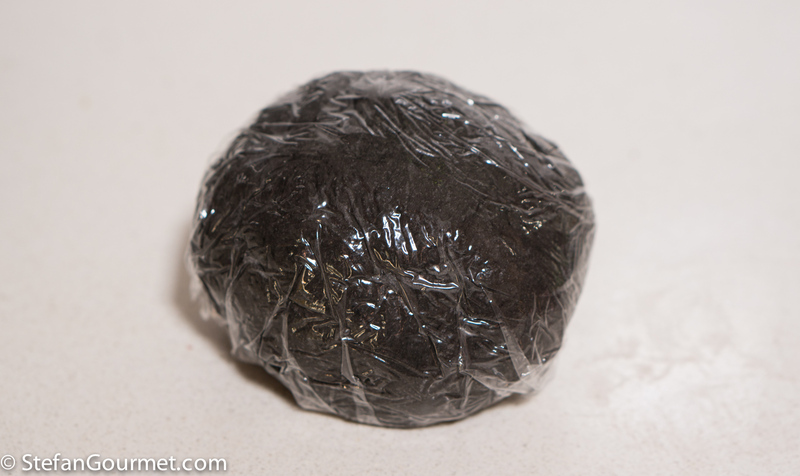 Wrap in plastic wrap and allow to rest for at least half an hour. Meanwhile, fillet the red mullet or ask your fish monger to do it. Reserve the fillets for now. You should end up with 400 grams (14 oz) of fillets. Use the heads and bones to make fish stock with the onion, celery, and trimmings from the fennel. 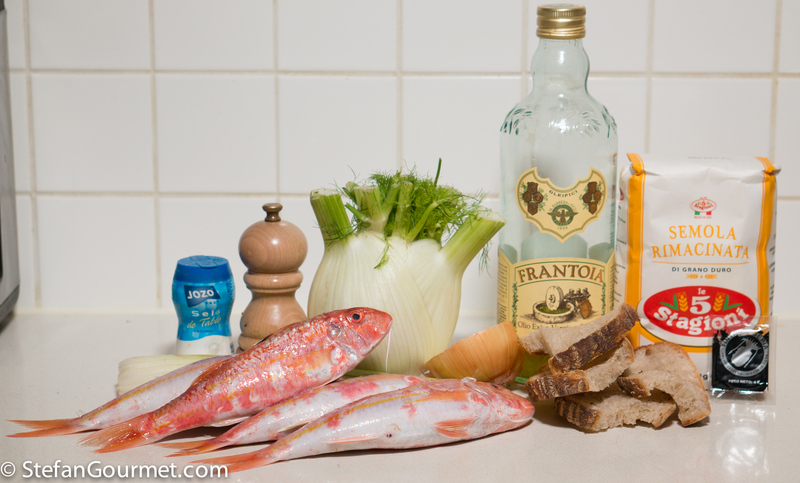 Instructions for making fish stock are here. 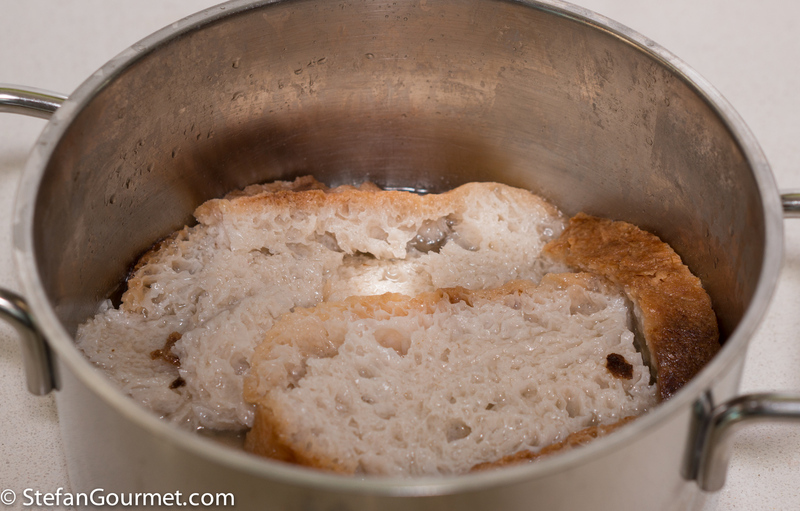 Once the fish stock is ready, soak the bread in it. When the bread is soft, squeeze out some of the excess fish stock (and reserve). 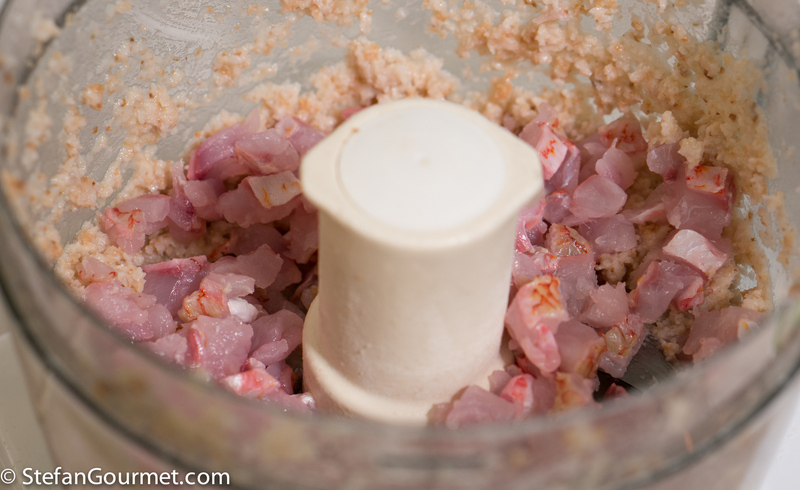 Put the soaked bread in a food processor together with half of the fish, chopped. Chopping the fish quite finely is important for making sure you don’t end up with longer pieces of skin the filling. 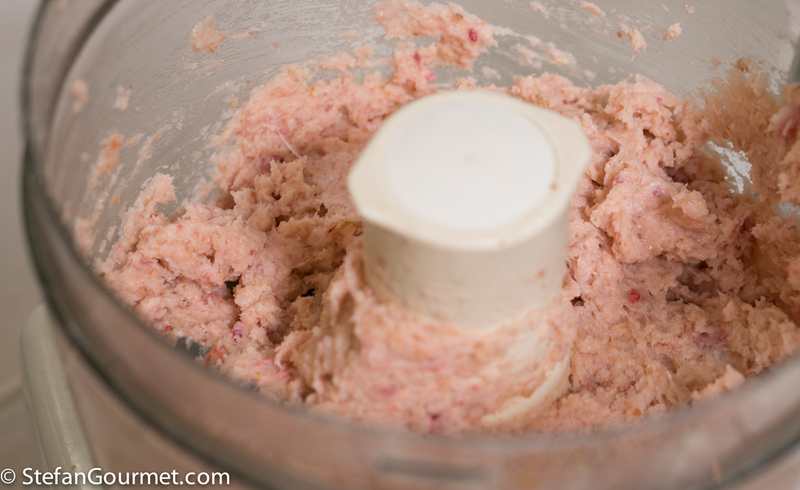 Process until pureed. Taste and adjust the seasoning with salt and freshly ground black pepper. 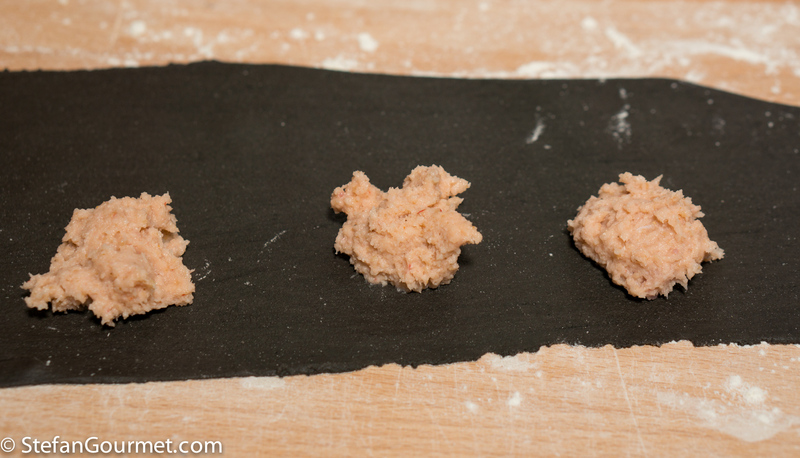 Roll out the pasta dough and make ravioli using my instructions. Preheat the oven to 225C/440F. 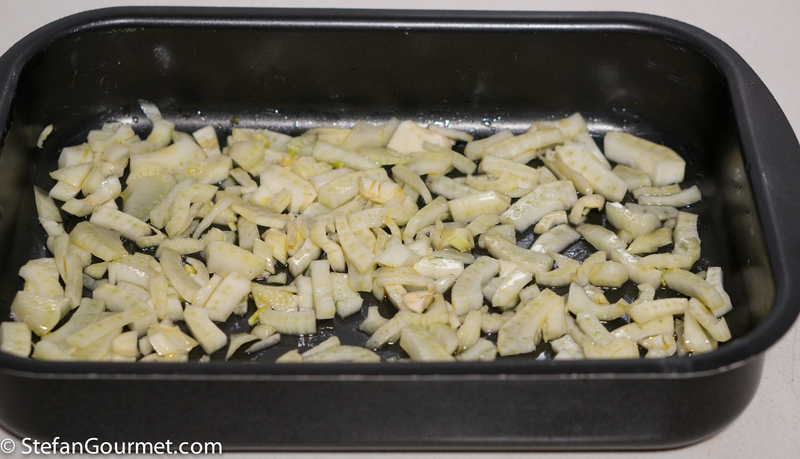 In the meantime, chop the fennel and toss it with olive oil in an oven proof dish. Roast the fennel for 10 minutes at 225C/440F. In the meantime, bring a large pot of water to a boil for the ravioli, and reduce the reserved fish stock to about 120 ml (1/2 cup) over medium heat. 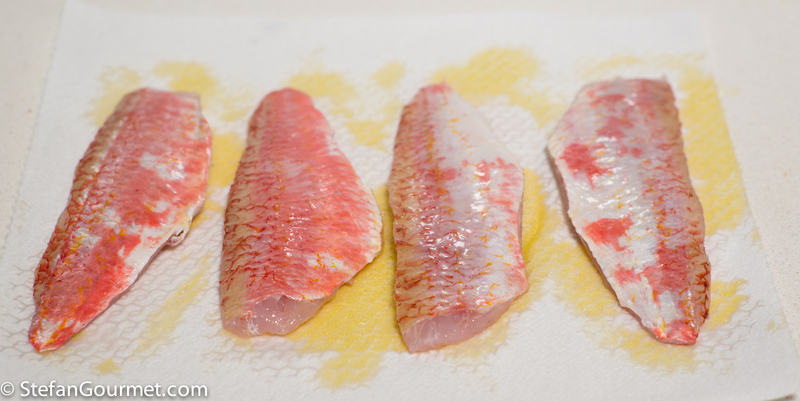 Season the reserved red mullet fillets with salt on both sides, and brush with olive oil. After 10 minutes, take the fennel out of the oven and stir. Season the fennel with salt. Arrange the red mullet on top. Now return to the oven for 5 minutes only to cook the mullet and finish cooking the fennel, not longer to avoid overcooking the mullet. In the meantime, add salt to the boiling water and cook the ravioli for about 2 minutes. Lift them out of the boiling water with a strainer. 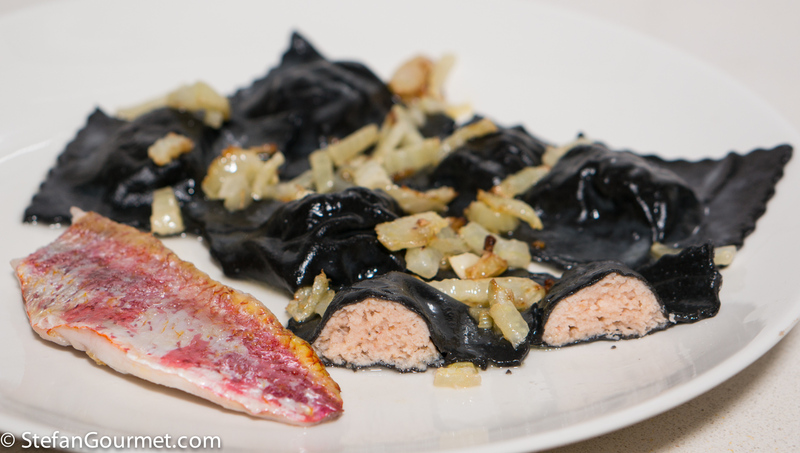 Arrange the ravioli on preheated plates with the fennel and the red mullet. Spoon the reduced fish stock over the ravioli, and serve at once. This works with many dry Italian whites. 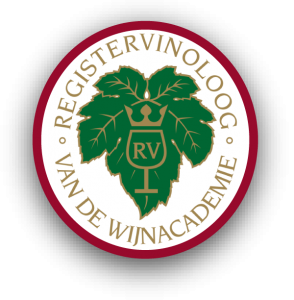 To stay within the region, a Fiano di Avellino would be an excellent choice. 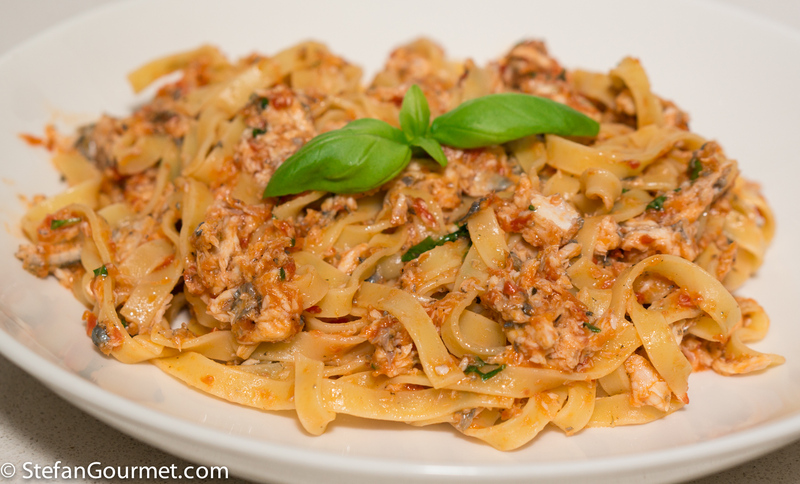 This eel ragù with fresh tomatoes and basil is very elegant and similar to a dish I had at Torre del Saracino. The tomato gives it freshness, while the eel makes is creamy. That pasta looks absolutely incredible, the colour is out of this world! I would love to try this exquisite dish. Your ravioli looks perfect. I double-blinked at the dramatic heading and smiled when the plating brought that home ! 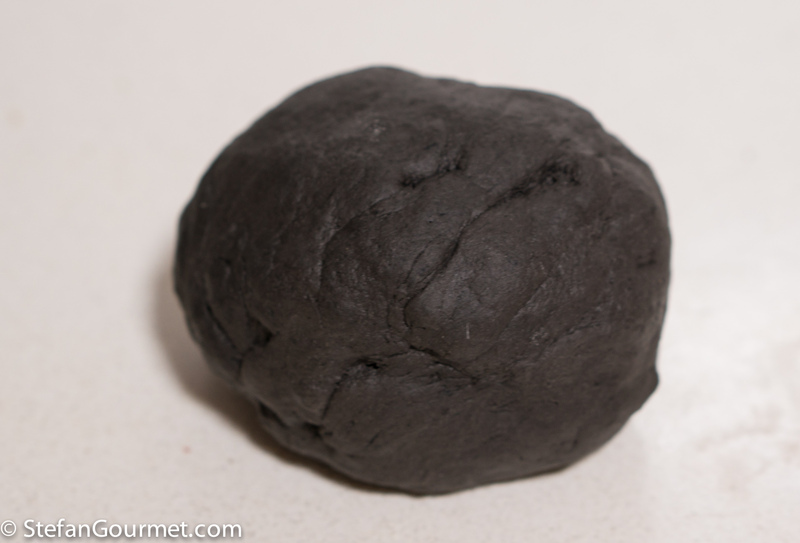 Having just ordered squid ink on line and loving anything to do with fennel . . . I’m on even if quite some work is involved 🙂 ! Would not prepare for self but want to see my friends’ faces . . . . The pasta looks fantastic and very dramatic! You were lucky to find such fresh fish. Red mullets spoil very, very fast. Usually, I buy fish at a professional wholesale market. Even there I almost never buy red mullets. They are not fresh enough for delicate preparations, let alone for sashimi. This was at a professional wholesale market (Hanos). I like the new blog layout. I love the dish. Soaking the bread is a great tip for adding a bit of flavourful bulk to the ravioli. Lovely job, as always. Che meraviglia questo piatto! E non avrei mai pensato all’accostamento con i finocchi. Devo farlo, Paola vinci la pigrizia e impasta!